It’s nice to see you! You haven’t changed one bit. You’ll have to excuse my absence—I’ve been very busy working on my tan. And y’all, I cannot even TALK about what the southern sunshine did to my blazing marshmallow white New York body on my first beach day. My advice to you? DO NOT APPLY SPRAY SUNSCREEN IN THE WIND. Be ye not so stupid. And if by chance you decide to throw caution [and sunscreen] to the wind, head on over to your local beach coffee shop to down an iced caramel latte or four. If there’s something that screams VACATION better than an iced latte, I wish you’d tell me what it is! I know. I KNOW. And don’t you worry, I’ve informed Kellan that my life cannot possibly be complete without a Teacup Pig to snuggle to my heart’s content. I’m not entirely positive that he cares given that his research shows one minor quirk in their breeding [you can’t exactly be sure that they won’t grow up to be 300 pound hogs], but nevertheless my commitment to a Teacup Pig of my very own will not be shaken! No matter how many times my husband threatens to eat it. 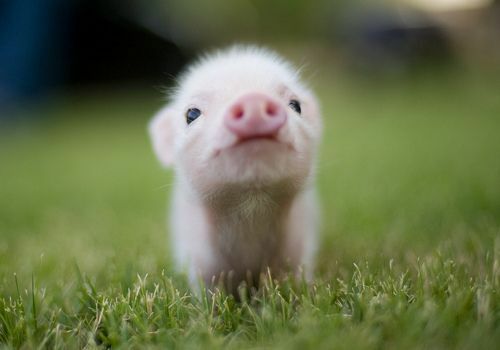 I’m still working on names, but thus far my front runners are Teacup Pig [This is my Teacup Pig Teacup Pig. Why do I love that so much? This does not bode well for future children…] and Paula Deen. Never have I ever been so torn. 1. They’re the cutest thing since EVER. 2. They’s smarter than dogs. 3. His wife may die of heartbreak if she doesn’t get one. I’ve wanted one for a couple of years!!!! They are adorable and eat less than dogs of their size, are affectionate, and cleaner than cats or dogs. They can also be house trained. I want to name mine Wilhelmina. Or possibly Porkchop. That’ so cute! My new name is Hamilton. ;) I just can’t stand how adorable they are! Will wonders never cease. How do you keep from stepping on one? How about Charlotte for a name? Good luck!